July 2011 – on my way: make it someday. This weekend I finally went on a hike with some views. Views! That’s what I’ve been waiting for. Figuring out where to hike around here has been confusing. 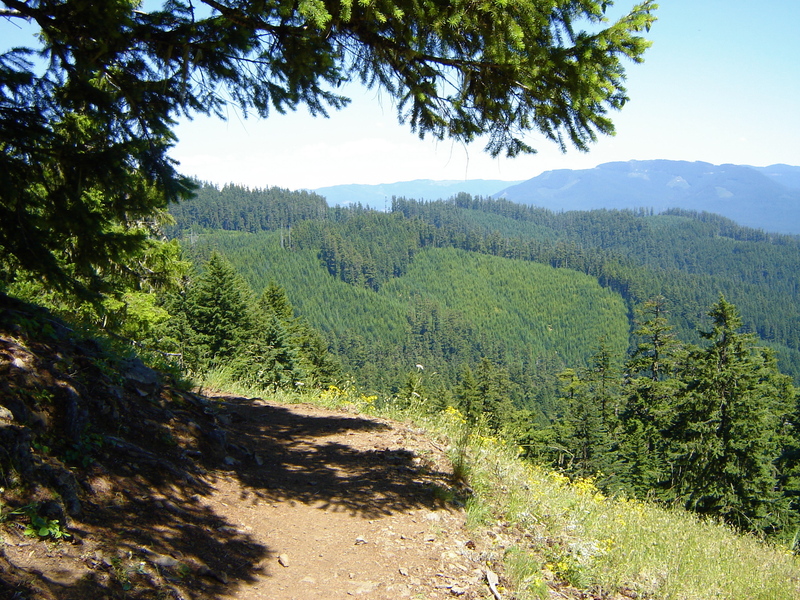 There’s places in town, like Spencer’s Butte or Mount Pisgah, which are definitely much higher than town itself and have nice views, but aren’t very rugged. They are crowded and I can run all the way up them in, well, not very long. It doesn’t feel rewarding to get to the top. And while there are plenty of trails out in the National Forest, most of them only begin once you’ve navigated a maze of access roads, which can be intimidating. Or it can just seem like too much hassle to drive out there on my own and figure out where the heck I’m going. So this weekend I went hiking with a friend. He picked the route because it was supposed to have nice wildflowers, and we both like our botany. He hadn’t been there before either, although he was familiar with the area around Oakridge, the trail hub outside of Eugene. We found ourselves driving up and up, more than 6 miles on narrow gravel access roads, wondering whether there was going to be any mountain left for us to hike by the time we got to the parking lot. And was there? Kind of. We had a nice leisurely trip which took a couple of hours, but only gained a couple hundred feet. We mostly skirted hills, which offered amazing views of the bigger mountains in the distance. We finally got to the top of Tire Mountain, and there wasn’t a view. But that was okay because we had nice views along the way. We sat in the shade – a nice bonus since it was really hot out – and ate our lunch and looked up the flowers we had seen. Am I a huge nerd? Yes. Was this way less intense than almost all of the hiking I usually do? Yes. Am I okay with that? Absolutely! I’m afraid that I’m going to have to try harder if I want to do any really serious hiking, and maybe drive further, too. But this a step in the right direction and a very happy way to spend my Sunday. I’m lucky to have made friends who like to do things outside. 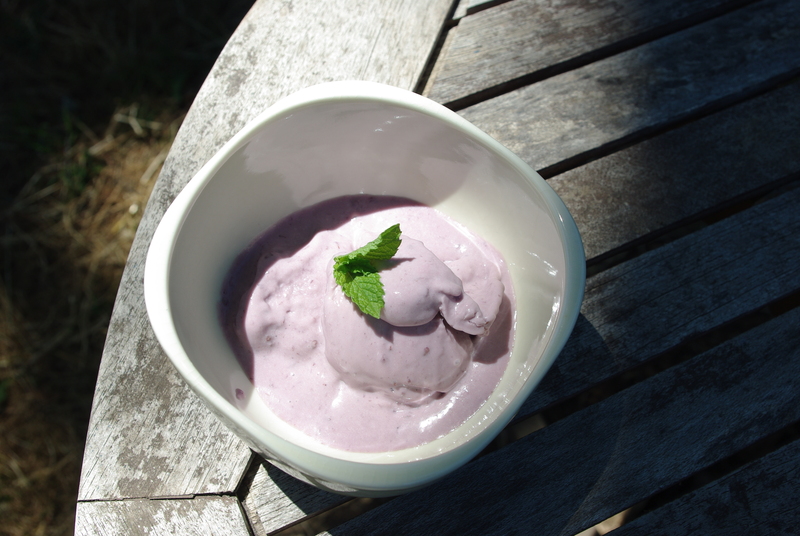 After a stiflingly hot drive back to town, we ate some homemade ice cream and recovered. Well done. maiden voyage of the ice cream maker. For months now I have been saying that I was going to buy an ice cream maker. It started in Florida, for obvious reasons – it was hot and I wanted ice cream, dammit. But there was always an excuse not to get one. In Florida, I didn’t want to have one more thing to pack in the car when I moved. Once I got to Oregon, it was oh, I’ll wait until my next paycheck. I had my eye on a model which wasn’t my ideal, but was affordable. About two days before my birthday, two boxes arrived at my house. Boxes! Presents! On Tuesday morning when I finally allowed myself to open them, what did I find but a Donvier ice cream maker and a cookbook of ice cream recipes. My parents really do know me pretty well. The Donvier was the ice cream maker of my dreams: no fussing around with ice because you just freeze the canister, but still the charm of hand-cranking. 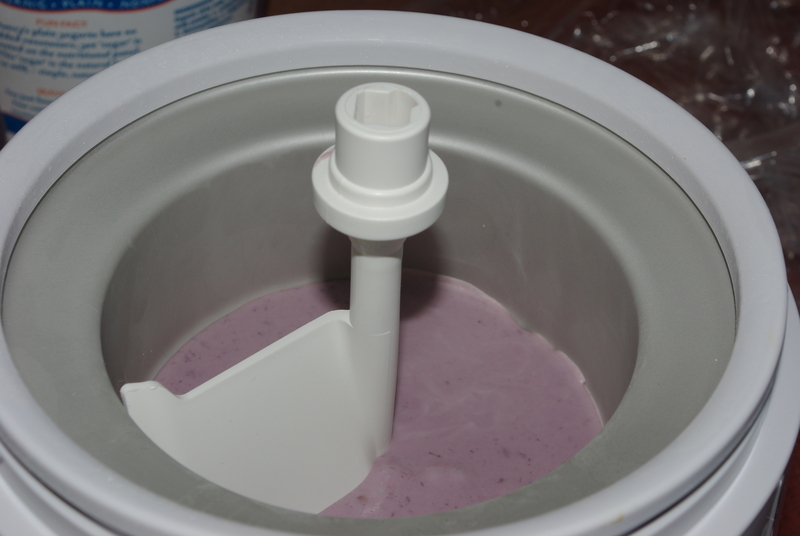 Plus, it was the ice cream maker of my childhood and all of those happy ice cream memories. I was ecstatic. Thanks, Mom and Dad! I began planning my first batch of ice cream pretty much immediately, but I was too busy to actually make it. The flavor was obvious though. My yard is overflowing with berries so it had to be a berry ice cream. 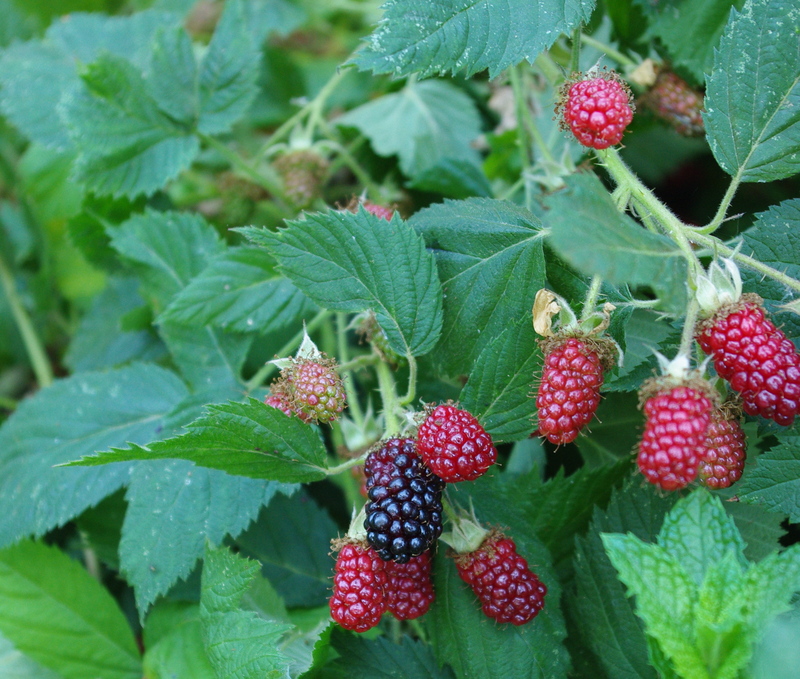 I settled on loganberries, a giant hybrid of blackberries and black raspberries. The bush in the backyard has just started producing and the berries are gorgeous. 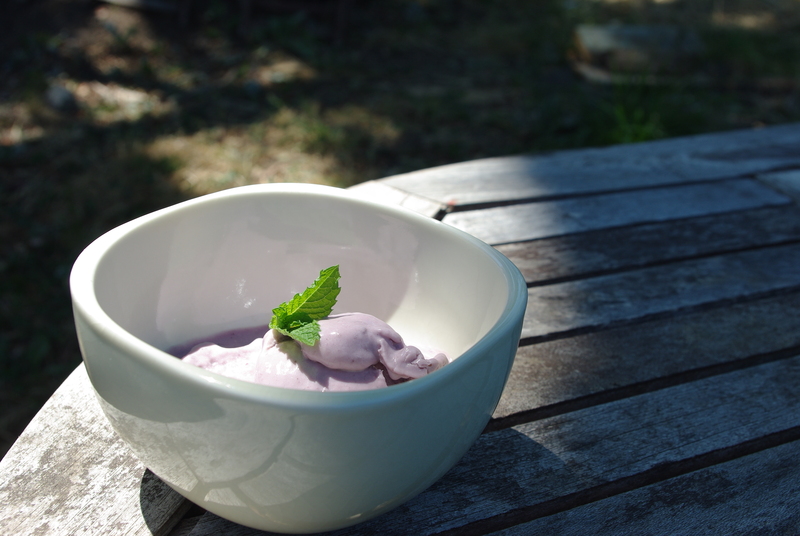 I used a recipe from the birthday cookbook – Jeni’s Splendid Ice Creams at Home – as the inspiration for my ice cream, even though I didn’t really follow a recipe. After all, you don’t find too many loganberry recipes. I had to adapt. Instead, I based my ice cream off of a roasted-strawberry buttermilk recipe. 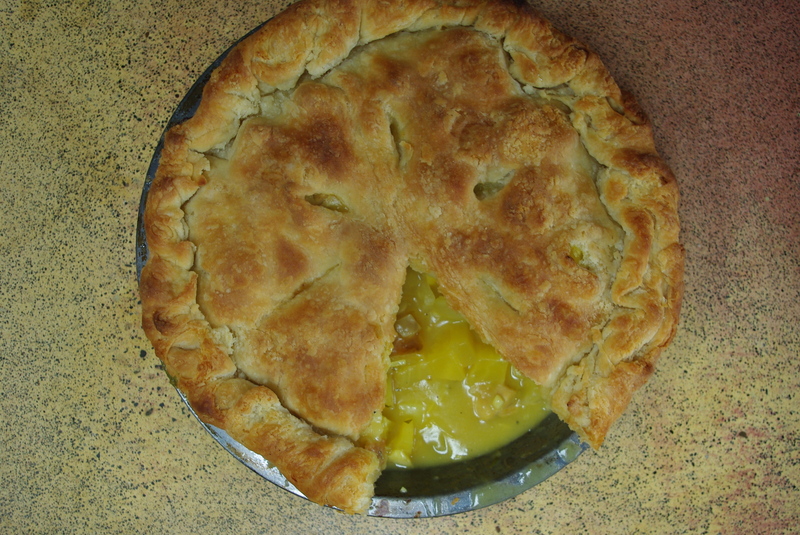 I also changed things up by using a custard base. To start with, I roasted the berries in the oven with some lemon juice and sugar. Interestingly, as they cooked they lost a lot of their dark blackish color and became red again, like their unripe brothers and sisters. After ten minutes or so in the oven they were nice and soft and juicy, and I tossed them in the blender to make a purée. 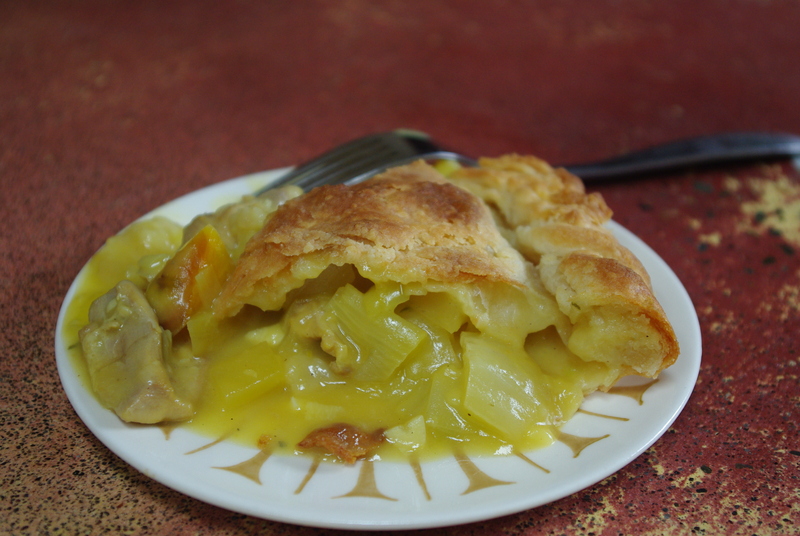 Next I tackled the custard. Not to brag or anything, but custard is pretty straightforward for me at this point. If you’re in the habit of making it, it’s easy. I recently made a cake for the fourth of July, a layered Scandinavian berry affair with custard in between the cake layers. The recipe came from The Scandinavian Cookbook and it taught me a trick about custards – when you heat up the milk (or cream) the first time, without the egg in it, don’t let it boil! You don’t have to get it fully up to temperature – just pretty hot, so you can temper the eggs. For some reason, thinking about it like this made custards seem even simpler. Finally, I had to put everything together. The recipe from Jeni’s suggested straining the berry mixture, but I didn’t have a strainer, so I just poured it in with the custard (I didn’t use it all, but the rest will go on top of my oatmeal for the next few days – so no complaints there!). Also in there: some crème fraiche and buttermilk for tang and lot of heavy cream. Mmm, cream. After sticking the base in the fridge for a few hours, I poured it into the Donvier canister, which I had kept in the freezer for about 24 hours. It was all clean and tidy and ready for its maiden voyage. Then I kept working away at my computer, taking a break every five minutes or so to churn the ice cream. The key with a setup like this is to not let it get totally frozen around the edges, where the cream actually touches the canister. 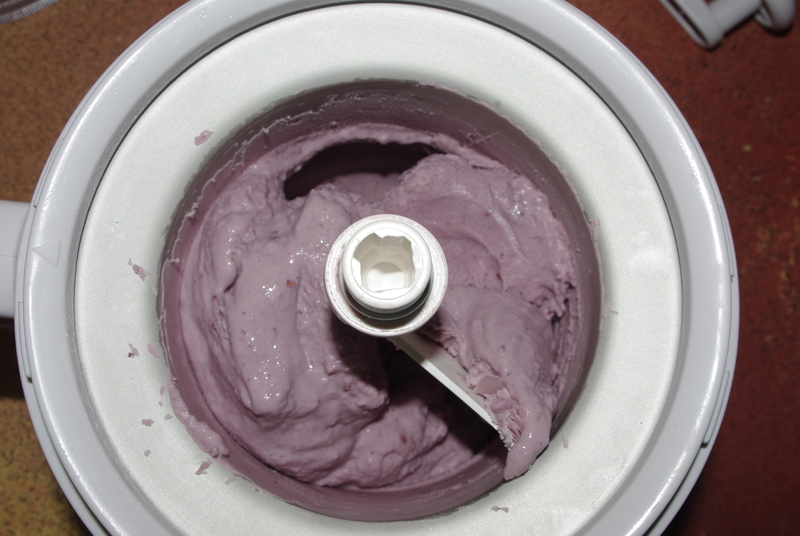 If you let it get too hard, it will be very difficult to turn the hand crank, and you’ll have frozen ice cream on the outside and merely chilled cream in the center. You have to mix the ice cream so that it ends up a fairly homogeneous texture. The beauty of making your ice cream is that you can choose whether you want soft-serve or hard-serve. I prefer something in between, and that’s what I got. Another score for making things yourself! When I took the top off of the Donvier, it just smelled like ice cream. You think of ice cream having a taste, but you don’t realize that it also has a smell. It does. It smells like yum, summer. So it smelled good. Visually, it was a beautiful purple. The texture had a few seeds from the berries but not in an annoying way. What sense is left? 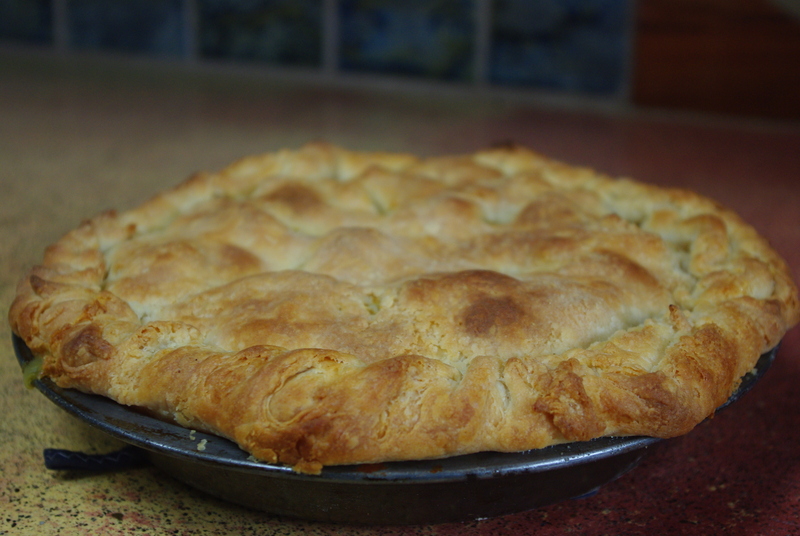 Oh yes, it tasted delicious. Sweet, tangy from the buttermilk and crème fraiche, and a little bit sharp from the berries and their lemon juice. Not overpowering in any one direction, but just an overall lovely ice cream. I hope some of you have ice cream makers and can churn up your own concoctions. I think that the technique on this one would work with any berries, and probably some other fruit as well. With the maiden voyage successful, I’m looking forward to many more tasty ice creams in the future. Start by placing the berries in a shallow pan or baking dish. Preheat the oven to 375 and while it’s warming up, squeeze the juice of the half lemon over the berries. Sprinkle on 1/4 cup of sugar and stir the mixture so that the berries are coated in both lemon juice and sugar. Bake them in the oven for ten or so minutes. You don’t want them to dry up, so don’t overcook them, but you want them to be soft and the juice should begin to run out of the berries and accumulate in the pan. When you think they’re done, pour the whole thing into the blender and purée them for a couple of seconds – it won’t take much because they’re already pretty mushy. Next, in a saucepan, whisk together the rest of the sugar and the cornstarch. Add in the milk, whisk well, and place over medium heat. Add the honey and stir periodically to make sure that nothing is burning to the bottom of the pan. In a small bowl, beat the two eggs. When the milk mixture is very hot but not yet boiling, slowly pour half of it into the egg bowl, whisking as you pour. Then pour the egg mixture into the saucepan again and keep whisking. Keep a close eye on the custard and whisk frequently; you will be able to tell that the mixture is thickening. Don’t overthicken because you don’t want the custard to become grainy; just let it get to the point where it is a loose pudding consistency. Remove from heat. In a bowl, stir the crème fraiche and salt together. Add the still-warm custard mixture, then 3/4 cup of the berry purée. Finally, stir in the cream and buttermilk. Put the ice cream base – because that’s what you have now – in the refrigerator for a few hours until it is uniformly cool. Then follow the instructions for your ice cream maker and enjoy your icy treat! I woke up early on Wednesday morning, cooked up some oatmeal, and threw it in a tupperware container before climbing in the car at 5:30 with my coworkers to drive up to Washington. 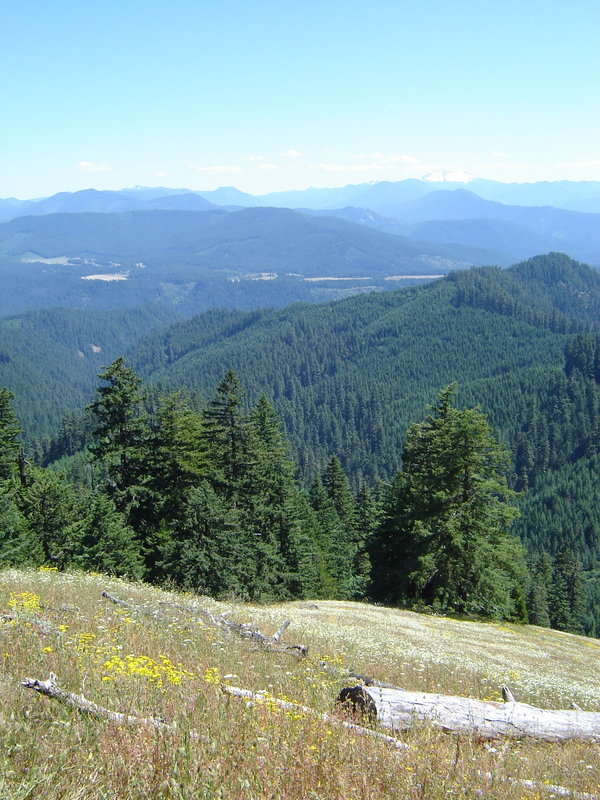 One of our three field sites is between Tenino and Rainier, and we go up there once every week or two. Sometimes, we bring as many people as we can find and try to get all of our fieldwork done in one day. It’s a long day, but when we get back at 8 or 9 p.m. we can crawl into our own beds and recuperate. Other times, though, people or busy or there is simply too much work. And so Tim, Sean and I brought our camping gear and prepared ourselves for a night in the field. Wednesday was hot and as we worked we became quieter and quieter, trying to minimize our energy and to not take our discomfort out on each other. We clipped biomass and measured plant after plant. At about four in the afternoon – after we’d been on the clock for almost eleven hours – Sean and I discovered that we had made a big mistake and had to try to fix it as we measured our next cohort of plants. It took some intense focus and reorganizing our brains. Then we discovered that the correction we had made was the opposite of the one we should have made. Start over again. We knew we each had only a few plants left to measure but my brainpower and patience was seriously fading. When we finished that cohort, we were done for the day, unable to imagine checking the basal area of even one more Microseris laciniata. Luckily, by then it was cooling down. We headed into town and Sean bought some bread and peanut butter at the grocery store while Tim picked up takeout Chinese. We drove to a state park and ate our dinners at a mossy picnic table amidst the tall, quiet trees overlooking a deep lake. Ah. Peace and quiet. And shade. When we got back to the site and each cracked open a beer, the temperature was quite manageable. 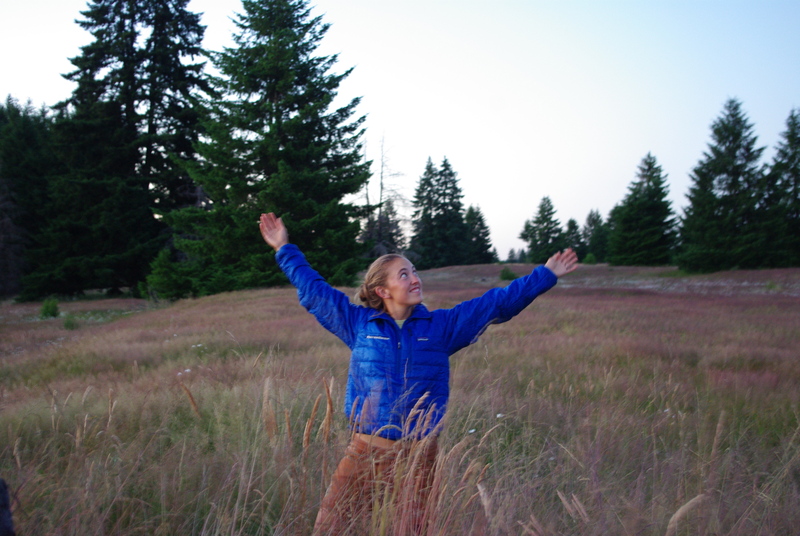 I even put on a sweater when I headed out into the prairie of the Nature Conservancy preserve. 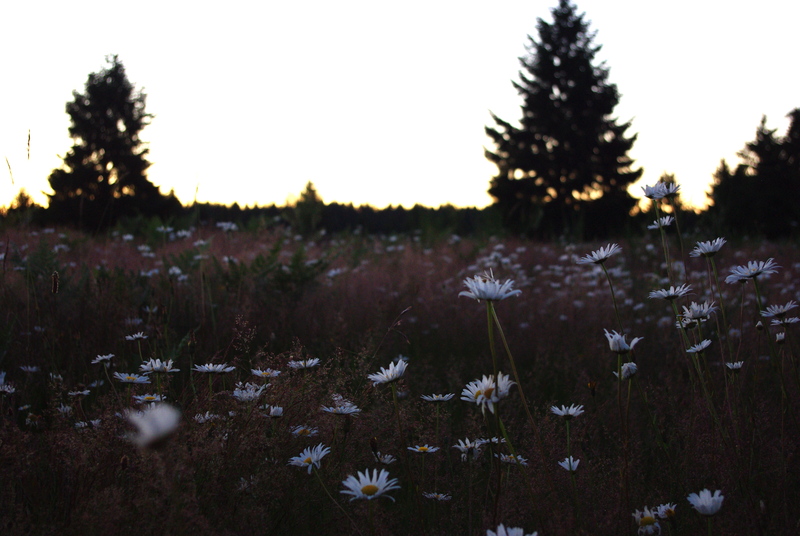 It was a beautiful evening and I was in a beautiful place, and most excitingly, my 12-hour workday was over. 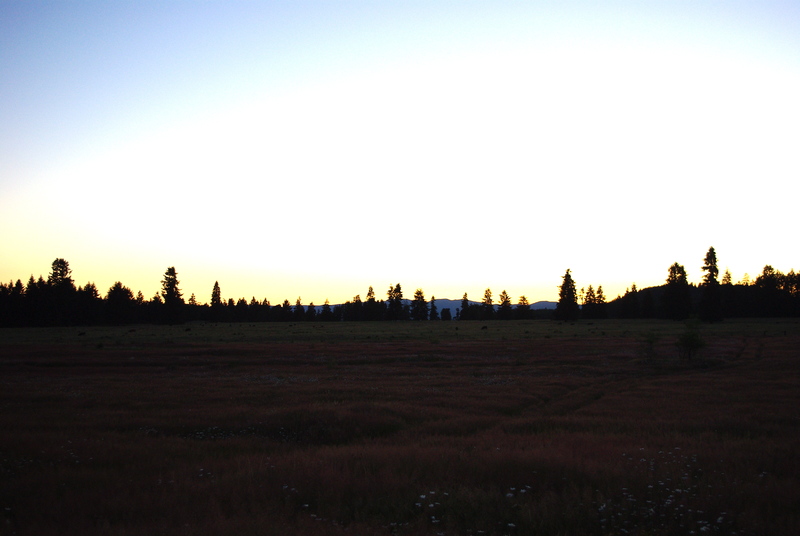 When I got back to the site, Sean asked whether I had seen Mount Rainier. He implied that I simply hadn’t walked far enough “around the corner” and so we headed off together, me insisting that the corner did not exist and we couldn’t see the giant mountain, and Sean protesting that I was wrong. We never did find the mountain, which we only saw on the road driving to the site. 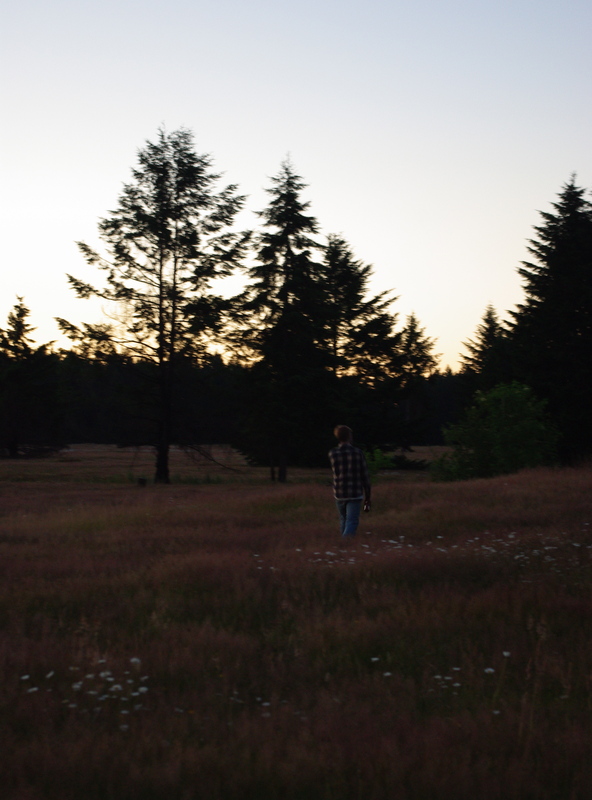 But we did get to revel in dusky savannah, which was enough. The moon rose and the cows stopped lowing. We headed back to the sites, where we still had work to do that night, under the cover of darkness and in the absence of the daytime wind. Thursday dawned foggy and cold. The sun came out at about 2:30. We were tired from working the night before and knew there was no way we were going to make it through all of the plants we were supposed to measure. Even a trip to the Giddyup Coffee Corral in Tenino, where I very uncharacteristically bought an espresso drink called a “nutty pony” (it was delicious) couldn’t change the fact that we were going to leave five cohorts of unmeasured plants for the next trip. While Tim mowed around the site with the push mower, Sean and I dictated measurements to each other. Plot 38. Nail B7. Pink Pin. Two leaves. Basal area 27 x 14 mm. Unassisted height 54 mm. Longest leaf 87 x 2 mm. No flowers. 30 mm SW of the nail. Repeat. By the time we were driving home we were cranky and sick of each other. To make matters worse, we got stuck in Portland traffic. When I arrived back on Grant Street at 7:30 that night, I couldn’t be more relieved to have the house to myself and to take a shower. 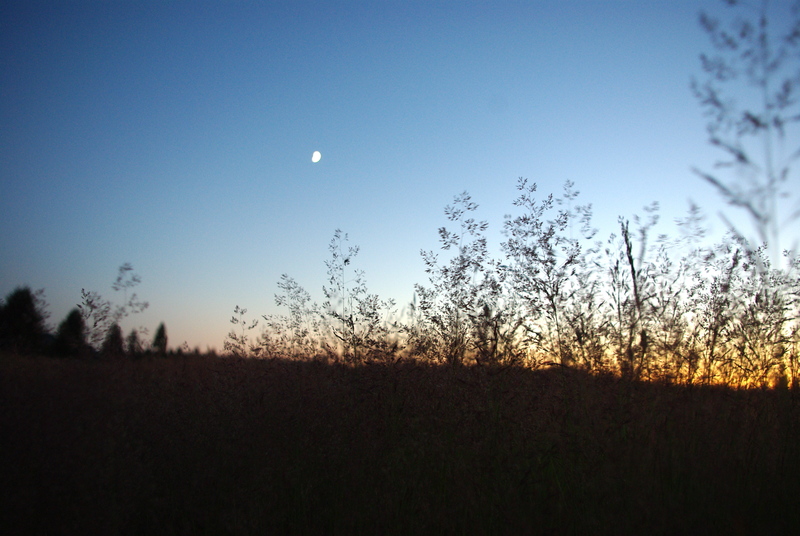 But even though work had been hard and it was unsatisfying not to check more tasks off of our list, I still had the memories – and pictures – of a beautiful night on the prairie, so the trip was worthwhile anyway.